The Miami Hurricanes baseball team debuted new 2015 season players in a 4-1 win over former Canes during the annual Alumni Game at Mark Light Field Saturday night. 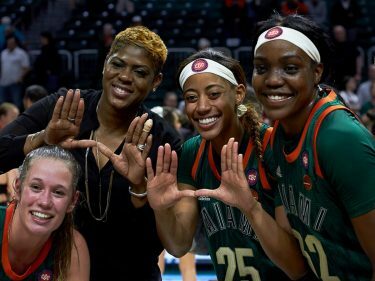 A chance to gauge the team’s performance ability before the season officially begins, the Alumni Game also showed Hurricanes coach Jim Morris what the team has to work on before Opening Day. The Canes had three errors during the game, and half of their runs were scored on wild pitches. Before the start of the game, Hurricanes baseball announcer Jay “JayRo” Rokeach introduced more than 50 alumni, including Jon Jay of the St. Louis Cardinals and Yonder Alonso of the San Diego Padres, eight members of the 2014 ACC Regular Season Champion team, and 88-year-old Larry Adams of the 1948 Hurricanes. Following the intros, ACC Freshman of the Year Zack Collins and ACC Co-Pitcher of the Year Chris Diaz were presented with their ACC trophies. Several new Hurricanes made their debut during the game, including starters freshman outfielder Carl Chester and transfer infielder George Iskenderian. Freshman outfielders Justin Smith and Malik Rosier earned playing time as well. As did freshman left-handed pitcher Michael Mediavilla, high school teammate of sophomore outfielder Willie Abreu who, like Abreu, was selected by the Cincinnati Reds in the Major League Baseball First-Year Player Draft. Junior right-handed pitcher Enrique Sosa opened for the Hurricanes, and Boston Red Sox prospect Chris Hernandez, who played on the last Canes team to reach the College World Series, was the starting pitcher for the alumni. Both kept the first inning scoreless. The Hurricanes scored their first run in the second inning when David Thompson came home on a wild pitch. The alumni responded in the top of the third, as Dale Carey hit a sacrifice fly with the bases loaded, bringing Brad Fieger home to tie the game at 1-1. Miami took the lead in the fourth when Thompson plated another run and then scored two more runs in the fifth inning. That final run was scored by Iskenderian on another wild pitch, sealing the game at 4-1. The sixth inning onward saw a cycle of pitching changes for the Hurricanes and hitting swaps for the alumni, giving four Canes pitchers a chance to practice for an inning apiece and the older former players a chance to step back on the field. Hurricane relievers Bryan Garcia, Cooper Hammond, Mediavilla and Ryan Otero all pitched scoreless innings. While Otero, who made only one relief appearance last season, closed out the game without letting up a run, he did allow a redemptive line-drive single by 1991 alum Preston Mack, who went 0-for-1 in his two game appearances that season. Senior Garrett Kennedy had a good night offensively, going 2-for-3, but the out was a pop fly that ended the second inning on a double play. Two-time national champion Kris Clute (1999, 2001) had two hits and a steal for the alumni. Clute’s former teammates Kevin Brown and Javy Rodriguez also started for the alumni, in addition to Danny Figueroa – one of Miami’s greatest center fielders whose last season as a Hurricane was in 2005 – and more recent alumni Chantz Mack, Alex San Juan, Tyler Palmer, Carey and Fieger.